Watch “paintings” come to life! Paint by Sticker Birds celebrates the rainbow of colors and shapes of the avian world: a redheaded woodpecker, a blue jay, an orange, and black Baltimore oriole, an electric bright hummingbird, and more. Paint by Sticker is a compelling activity for crafters and artists, doodlers and colorers of all ages. 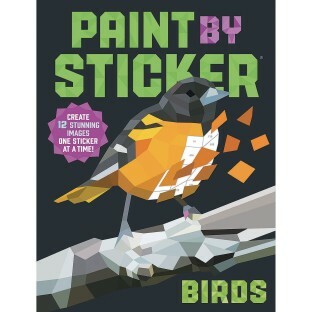 Each Paint by Sticker book includes everything you need to create twelve vibrant, full-color “paintings.” As in paint-by-number, each template is divided into dozens of spaces, each with a number that corresponds to a particular sticker. Find the sticker, peel it, and place it in the right space. Add the next, and the next, and the next—it’s an activity that’s utterly absorbing, both in the relaxation of peeling and sticking and the satisfaction of watching a “painting” come to life. Contains 12 different 9” x 12” images plus sticker sheets and easy instructions to complete each. 56 total pages. Pages are perforated for easy removal. If you like adult coloring books this is the next step for you. This is harder than it looks because some of the stickers are very very small--and sometimes the stickers are hard to peel. But--these are fun to do and my residents said they enjoyed making this. I would not recommend this for anyone younger than a teenager or anyone with cognitive issues.